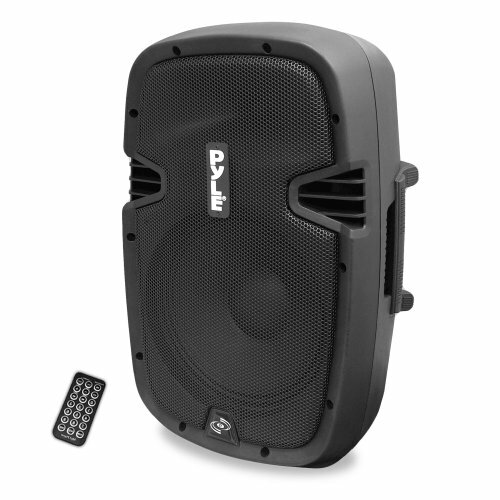 Pyle PPHP1237UB Powered Active PA Loudspeaker Bluetooth System with Microphone - 12 Inch Bass Subwoofer Stage Speaker Monitor Built in USB for MP3 Amplifier - DJ Party Portable Sound Stereo Amp Sub for Concert Audio or Band Music by Pyle at IGWT. MPN: PPHP1237UB. Hurry! Limited time offer. Offer valid only while supplies last. HIGH QUALITY SOUND REPRODUCTION: Pyle PPHP1237UB pa system is fully equipped with a heavy duty self powered 12 inch subwoofer for ultimate bass. HIGH QUALITY SOUND REPRODUCTION: Pyle PPHP1237UB pa system is fully equipped with a heavy duty self powered 12 inch subwoofer for ultimate bass. Powerful 900 watts this self powered speaker effectively reproduces the entire studio audio spectrum and will not get drowned out in even the largest venues. COMPATIBLE WITH ANY MEDIA: Easily connect all types of portable pa loudspeaker bluetooth DJ system party or band equipment to the RCA input line in. Works with all your favorite bluetooth enabled devices Apple iPod, iPod Touch or iPhones to the dock for charging or playback. Play MP3 files from USB input. CHAIN LINK MULTIPLE SPEAKERS: Connect number of digital active powered speakers monitor using a standard XLR cable from one monitor’s line out port to the next loudspeaker’s line in to play mono or stereo amp music. XLR input makes it easy to connect a mixer or use the mic in port to add instrument directly. GREAT FOR ANY VENUE: The handle makes transporting these professional stage speakers from home to concert simple. Built in port allows you to setup the compact dj sound system speakers on a standard mount. The high, mid and bass frequency knobs allow adjustment for locations like outdoor or in a church. BUILT TO LAST: Protected by a circuit and engineered abs box construction this amplifier is built to last. Complete satisfaction guaranteed! We stand behind this product with a limited 1-Year manufacturer's warranty. Contact us If the item show any defect we will help repair or exchange it for a new one. CHAIN LINK MULTIPLE SPEAKERS: Connect number of digital active powered speakers monitor using a standard XLR cable from one monitor's line out port to the next loudspeaker's line in to play mono or stereo amp music. XLR input makes it easy to connect a mixer or use the mic in port to add instrument directly. Bluetooth Wireless Music Streaming Ability - Works with Bluetooth Compatible Phones, MP3 Players, Tablets, etc. Impedence: 8 Ohm - Voice Coil: Kapton 2.5 inch - 110/220 Voltage Selectable - Magnet: 50oz.